At its Unpacked event in Barcelona today, Samsung announced the long-awaited Galaxy S9 and S9+. The latest iteration in the Galaxy series incrementally improves on the S8/S8+ in a few small but crucial ways. The S9 and S9 plus feature a new low-light optimized dual aperture camera system (f/1.5-f/2.4), 960 FPS slow-motion video, and AKG-branded stereo speakers. Physically, it might look a lot like the Galaxy S8—and pricing matches last year's at $719.99 and $839.99—but there's one significant distinction. The fingerprint sensor is finally in the center, below the camera module, where it always should have been. Most of the S9 and S9+ specs leaked earlier a while back, so the table below shouldn't have any major surprises for those that have been paying attention. SoC 8-core Snapdragon 845 (4 at 2.8 GHz, 4 at 1.7 GHz). RAM 4GB (S9), 6GB (S9+). Display 2960x1440 Curved Super AMOLED: 5.8" (S9), 6.2" (S9+). Battery 3,000mAh (S9), 3,500mAh (S9+). Cameras Rear: "Super Speed Dual Pixel" 12MP with OIS f/1.5-f/2.4, Telephoto 12MP w/OIS f/2.4 (S9+); Front: 8MP f/1.7 AF. Dimensions 147.7mm x 68.7mm x 8.5mm, 163g (S9), 158.1mm x 73.8mm x 8.5mm, 189g (S9+). Audio Stereo AKG speakers, headphone jack. The international version of the S9 and S9+ will be mostly similar, but with Samsung's in-house Exynos SoC—likely the 9810 announced earlier this year—and other storage sizes. Compared to the S8 and S8+, it might not look like very much has changed when it comes to specifications. Battery sizes remain the same, camera and screen resolutions are identical, and dimensions have only shrunk the tiniest bit for each. They have the same IP68 water and dust resistance, fast wireless charging, and the same Qualcomm Quick Charge 2.0. Samsung's S9 and S9+ do make one significant improvement, though. The fingerprint sensor has been relocated. It's no longer an afterthought slapped on the side of the camera module, now it's centered beneath it. That might seem like a small change, but the previous location was exasperating for many. 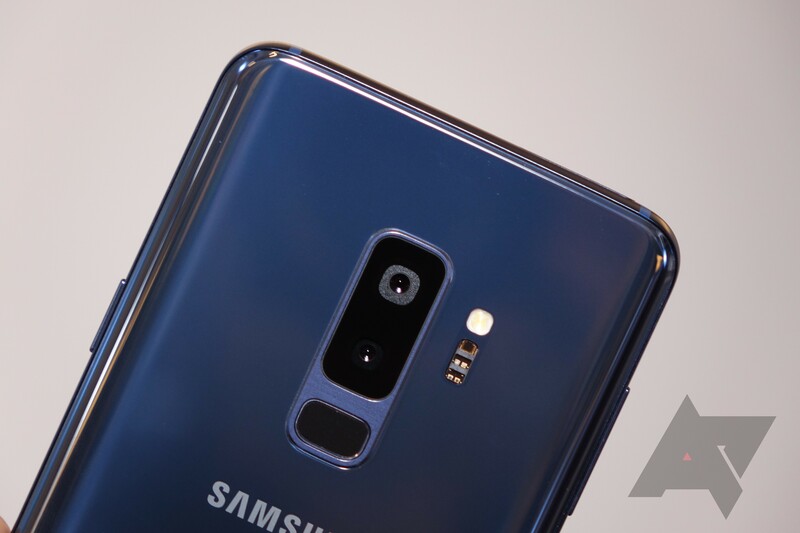 The S9+ also has an almost token increase to 6GB of RAM (from 4GB, as in the case of the smaller S9 and S8), but based purely on paper metrics the biggest difference in this new generation of phones is the camera. The new S9 phones have an adjustable aperture camera, able to transition between fixed f/1.5 and f/2.4 sizes, in comparison to the fixed f/1.7 aperture on the previous generation. That wider aperture should translate to improved low-light performance. Both phones feature a new "Super Slow-mo" mode that can record slow-motion video at 960 FPS, like Sony's XZ phones. The larger S9+ even gets a secondary 12MP telephoto camera this time around (the same one found on the Galaxy Note8), further differentiating it from the smaller S9. 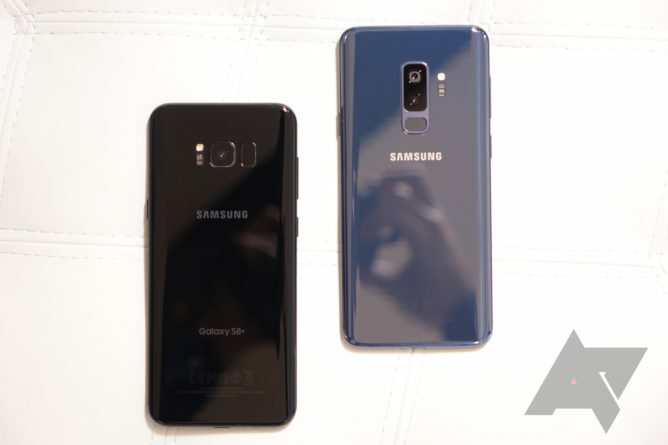 The Galaxy S9 and S9+ also have stereo speakers via the earpiece and a downward-firing speaker on the bottom. They're tuned by AKG (i.e., Harman; i.e., Samsung) and support Dolby Atmos surround sound for a 360-degree sound effect. The S9 and S9+ also thankfully still feature headphone jacks. On the software side, the Galaxy S9 and S9+ have a new AR Emoji feature, sort of like Apple's Animojis, which uses a bit of 3D modeling to allow you to create customized animations based on your own facial expressions. 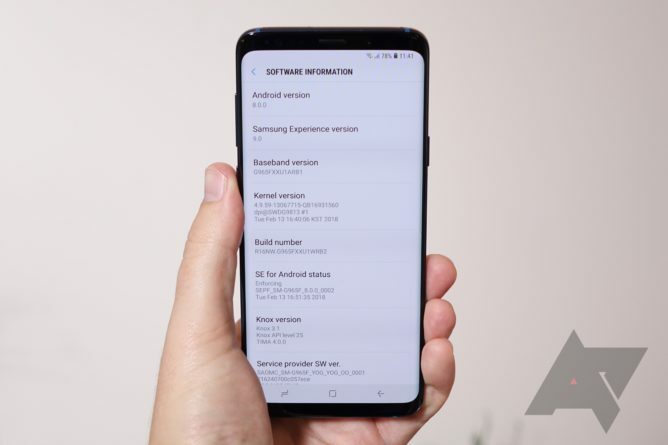 Samsung's shipping these handsets with Android 8.0 Oreo out of the box, so in addition to all the sweet new Oreo features like background activity restrictions execution limits and picture-in-picture mode, it should also support Treble. Even if an unlocked bootloader isn't in the cards, it might help with the frequency of software updates. Like was previously rumored, the new phones also have a new Intelligent Scan feature that combines Samsung's iris scan tech with facial recognition, and Samsung's still pushing Bixby just as hard as it did on the S8. 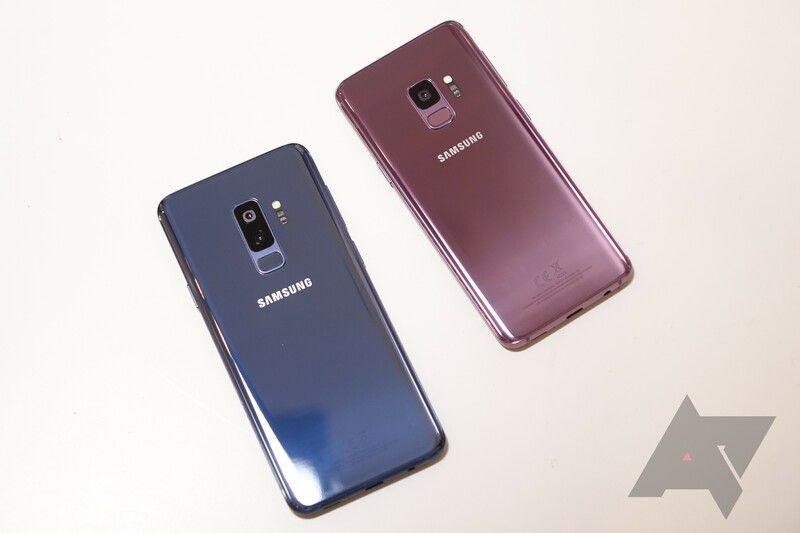 Samsung's Galaxy S9 and S9+ will be available in Lilac Purple, Midnight Black, and Coral Blue. Preorders begin March 2, with AT&T, Cricket Wireless, Metro PCS, Sprint, T-Mobile, U.S. Cellular, Verizon, and XFINITY Mobile all carrying the new handsets in stores starting on March 16th, though not all colors will be available on all carriers. Best Buy, Amazon, Costco, Sam's Club, Target, and Walmart will also stock the handsets on the same date. And, of course, you can purchase the phones directly from Samsung, including 24 month financing options ($30/mo for 24 months for the S9, $35/mo over 24 months for the S9+). Unlocked pricing for the handsets is the same as last year, with the Galaxy S9 running $719.99 and the S9+ at $839.99. SEOUL, Korea – Feb. 25, 2018 – Samsung Electronics Co., Ltd. introduces the Samsung Galaxy S9 and Galaxy S9+, the smartphones that reimagine the way we communicate, share and experience the world. 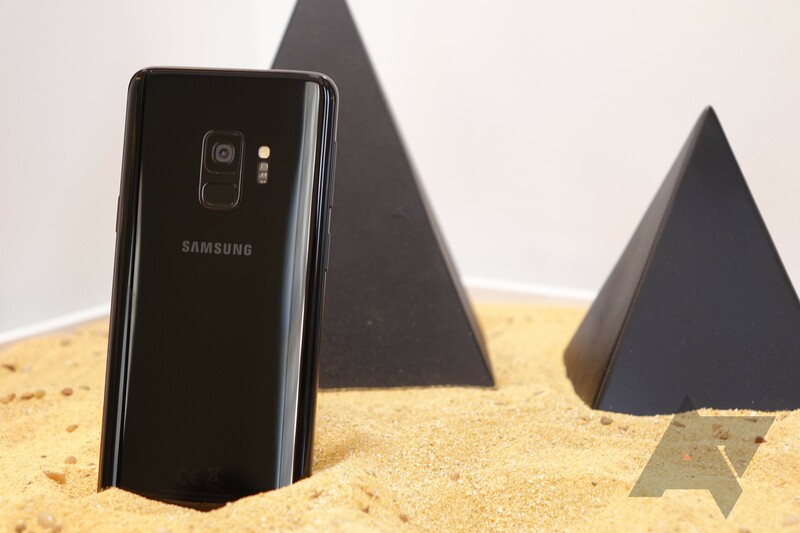 Made for the ways we increasingly communicate and express ourselves with images, videos and emojis, the Galaxy S9 and Galaxy S9+ drive innovation with Samsung’s most advanced camera ever. Redesigned with a new dual aperture lens that powers an innovative low light camera, Super Slow-mo video capabilities and personalized AR Emoji, the Galaxy S9 and Galaxy S9+ ensure you never miss a moment and make your everyday epic. With Samsung Premium Care, you get more than just protection for your device, you get a team of Samsung pros ready to come to you. Just pick the time and place, and they’ll provide one-on-one technical support and assistance for everything from the setup of your device, to troubleshooting, to hand delivery of a replacement should anything happen to your phone. 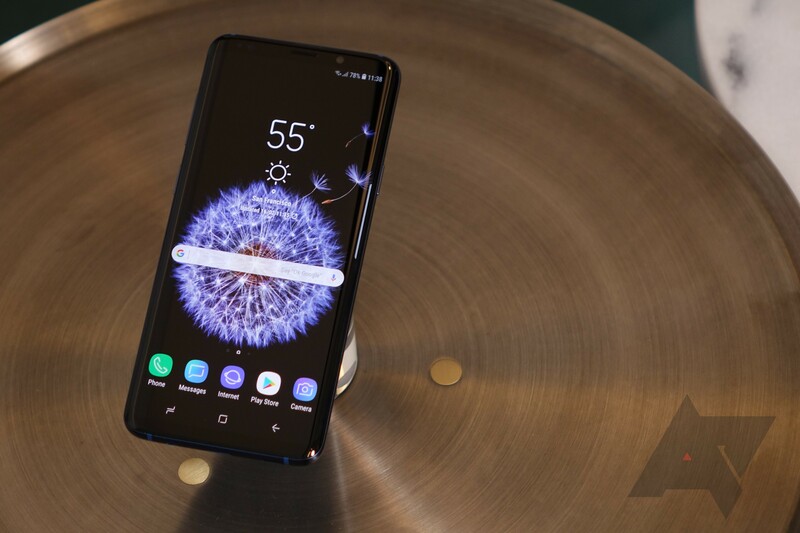 Premium Care is part of Samsung’s commitment to ensure that your location is our location, anywhere in the U.S. Enroll your new Galaxy S9 or Galaxy S9+ and get one month of protection free. For more information, please visit: http://www.samsung.com/us/support/premium-care/.